Alright, I'm not a manicure/pedicure girl. Rather, I just apply black color to my nails, and after the color fades away, the chapped nail polish stays on my nails, for a month. Well, that's just me. I guess I have nice hands and feet (at least my mom says so), hence I don't need anything. This is what I feel. 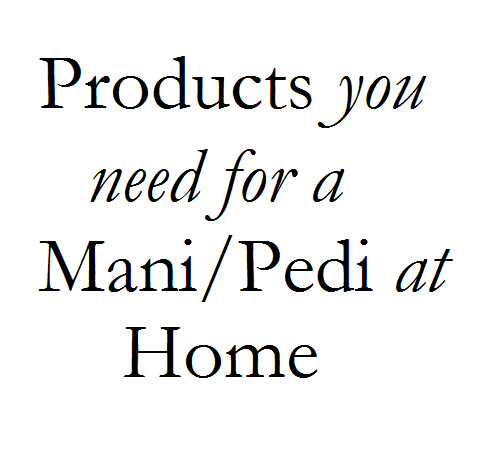 But, anyway, I've got you a list of products that you need at home, for a manicure and/or pedicure. Base Coat- It's clear nail polish that is supposed to be put before the nail polish coat. Top Coat- Obviously it is the coat that you apply after the polish. It comes in many forms like sheer, iridescent, opaque and metallic. Nail Filer- A thing by which you can shape nails. Cuticle Softener- It's a cream that you need to apply to your cuticles for a soft feel. Orange Stick- It's a soft stick which has a flat edge, and is used to push the cuticles back. Nail Brush- It is to clean the area under your nails, or to clean your nails. Nail Nipper- It's used to cut off the tiny nippers that hang near your nails. It's sharp, so be careful. Toe Spacers (for pedicures only)- They're foamy contraptions to separate your toes, so that you can apply the polish easily. Foot File (for pedicures only)- They're like big nail filers. They're used on the dry and hard parts of your feet to soften them, but hey, soak your feet first, and then use it. Don't use it on dry feet. Cotton Balls- Cotton can be used to separate toes or fingers. Q-tips/ Ear Buds- They're used to remove the bit of the nail polish that's out of your nails. Just dip a ear-bud in the remover and wipe that extra nail polish off. I hope the list was of help. What's in my Pencil Case?